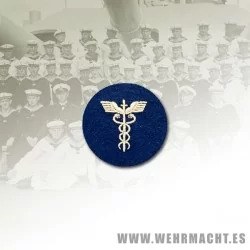 Welcome to our Kriegsmarine section. We have a selection of german insignia of the navy, like Booat members, Uboot and Coastal Artillery, as well as cap badges, tunic eagles, shoulder boards, metal badges and collar tabs. 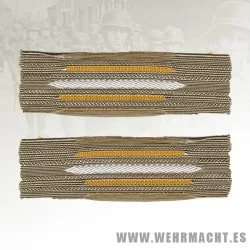 We also have a range of German armbands and cuff titles. Our products are designed for museums, collectors, reenacment and other theatrical purposes, as well as cinematographic and television productions. The sale of this material is not intended to advocate any totalitarian state or any past, present or future political ideology. 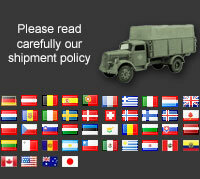 We warn that some of the symbols that appear can hurt feelings to people or groups. Administrative Maat Sleeve Insignia, embroidery on cotton navy blue with yellow thread. Original used by the Bundeswehr. Administrative Maat Sleeve Insignia, embroidery on white cotton with navy blue thread. Original used by the Bundeswehr. Administrative Maat Sleeve Insignia, embroidery on wool navy blue with yellow thread. Original used by the Bundeswehr. 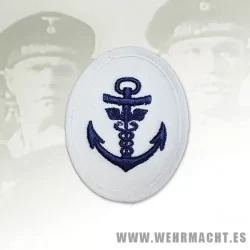 Administrative Matrosen Sleeve Insignia, embroidery on white cotton with navy blue thread. Original used by the Bundeswehr. 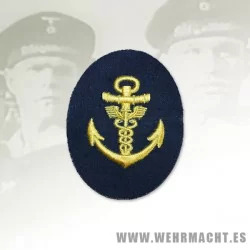 Administrative Matrosen Sleeve Insignia, embroidery on wool navy blue with yellow thread. Original used by the Bundeswehr. 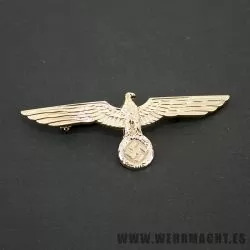 Germany Heer Generals or Kriegsmarine metal breast eagle. Worn on the tropical tunic by Wehrmacht Generals or Navy officers, this large eagle is die struck in solid brass and finished in heavy semi matt gilt plate. The makers mark 'A' (Assman & Sohn) is on the reverse. With pin back fitting. Boatswain Matrosen Sleeve Insignia, embroidery on white cotton with navy blue thread. Original used by the Bundeswehr. Boatswain Matrosen Sleeve Insignia, embroidery on wool navy blue with yellow thread. Original used by the Bundeswehr. Boatswain Obermaat Sleeve Insignia, embroidery on cotton navy blue with yellow thread. Original used by the Bundeswehr. 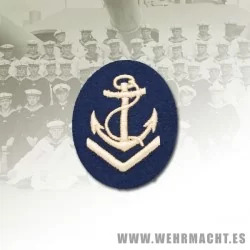 Boatswain Obermaat Sleeve Insignia, embroidery on wool navy blue with yellow thread. Original used by the Bundeswehr. Army Infantry enlisted mans woven collar patches. Silk woven type. Per pair. Coastal Artillery enlisted mans silk woven breast eagle. Yellow eagle embroidered over green background.